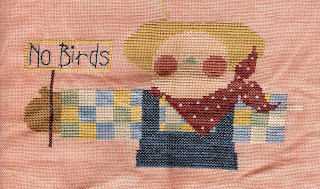 Well, it has been awhile since everyone has seen my actual stitching so I took the time the other day to scan all the pieces I'm working on (because my camera seems to be on the fritz) and here they are for you to look over....you will see a couple that I haven't put online very often and don't really work on much but I will get to them, at some point. Waiting for direction from my brother and sister-in-law as to what else they would like and then stitching that and adding the beads. Fall Y'All Which I am stitching for myself and hope to get done in the next couple of weeks so I can get it ready to hang for the end of September. Quilted Quips I've just started this piece which will be a present for my MIL or my grandmother, depending on how fast it stitches up. 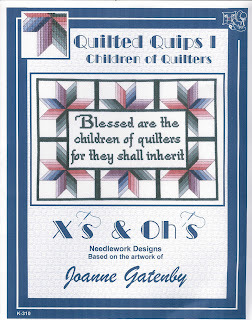 Here is the actual pattern front as well as the little bit I have done. 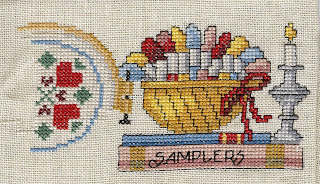 Cross Stitch Crazy Which will also be something for myself to hang over my chair where I sit and stitch. Again, the actual pattern front as well as what I have done. 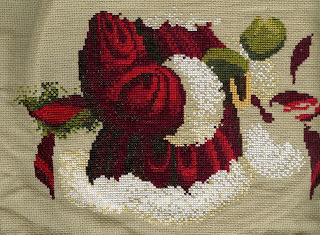 Spirit of Christmas I don't think I will have this one done before Christmas this year, but maybe next year! 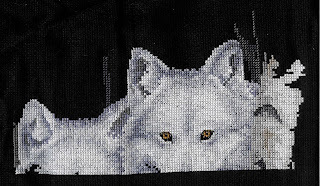 WOLVES ON BLACK This has been my focus piece and I did get a fair amount stitched on the tree trunk at the weekend getaway at Ann's last weekend. Rebecca, your wolf's eyes seem to be following me! I can't wait to see that one finished...love the birch trees! 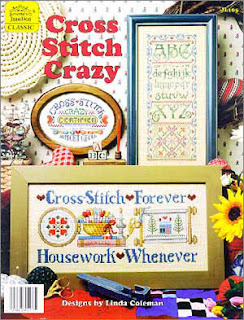 Cross stitch forever, housework whenever...says it all! Must run, its SAL Fred day! Wow! Everything's coming along great! Especially the Wolves, I'm impressed! You've done a lot on them since the last time I saw them. Your DH must be pleased! Everything looks great-love the wolf! Let me see = I like the scarecrow, well maybe housework whenever, and then again children of quilters. Oh heck, I love them all. Your wolves are stunning. You do beautiful work Rebecca. Great WIP's! Must be hard to decide which one to work on LOL! 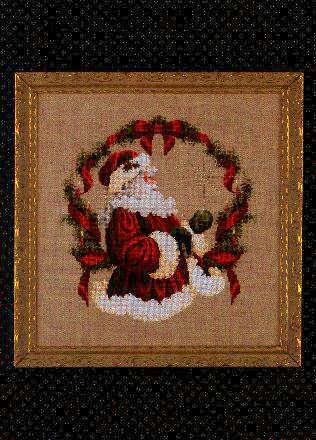 I did the Spirit of Christmas a while back and once it was framed I left it up on the wall for the first few years, Christmas or not! Rebecca everything is looking great!